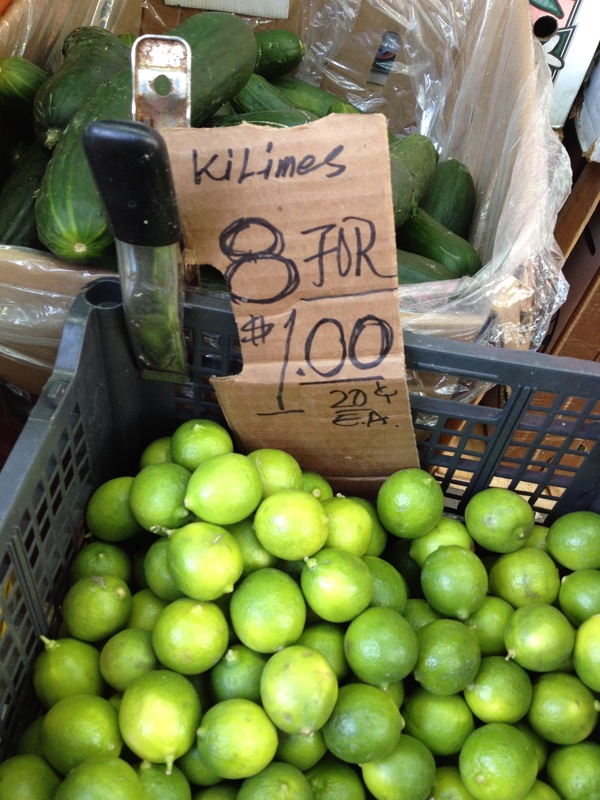 Walking home the other day I noticed this basket of key limes sitting in front of one my favorite Vietnamese/Chinese produce stands on Grand street. The sign made me smile. Do they have Key Limes in Vietnam? I bought a bunch, took them home and immediately got carried away doing research on Key Lime pie. The thing that make these tiny limes so special is the floral sent of the juice not like regular limes at all. The first recipe for key lime pie showed up on the side of a can of sweetened condensed milk. This explains why almost every recipe for this classic dish calls for 1 can of sweetened condensed milk. My version is extra tart and not in a crust made from store-bought cookies, but rather in a home-made graham cracker crust! In the bowl of a standing mixer with the paddle attachment add: 2 Tablespoons of brown sugar and 8 Tablespoons room temperature unsalted butter beat on medium high-speed until light and creamy – 1-2 minutes. In a separate bowl whisk together: 1 cup of All Purpose Flour, 1/4 Cup Whole Wheat Flour, 3/4 teaspoons salt, 1 Tablespoon of cocoa and 1/4 teaspoon Cinnamon. Add: 2 Tablespoons of Honey to the butter/sugar mixture and whisk until well incorporated. Reduce speed to low and add the flour mixture in two batches. When the dough comes together remove from the mixer and place between two pieces of parchment paper and flatten into a disk. Fold the paper around the dough and refrigerate it for 1-2 hours until chilled. Take the chilled dough out of the fridge and roll it into a thin round, remove the top sheet of parent and flip into a 9″ springform pan (this can also be done in a traditional tart tin). It will need some help once you have flipped it as it will inevitably not be even or may crumble and need to be pressed back into shape. The dough is very forgiving, so not to worry. Use your hands to form a more or less even edge around the pan about 2″ deep. Prick the dough with a fork and then refrigerate for 30 minutes. Place on a baking sheet and bake for about 25 minutes. Remove from the oven and place on a rack to cool whip you make the filling. Now preheat the oven to 350 F.
Place 4 large eggs yolks and 1 teaspoon of grated lime peel and a pinch of salt in the bowl of a standing mixer with the whisk attachment. On high-speed whisk for 5 minutes until the yolks have increased in volume and become lighter and creamier. Turn the mixer to low and slowly add 1 14 ounce can of sweetened condensed milk. Pour into the prepared crust and bake for 12 minutes. Remove from the oven and cool on a rack until room temperature. Chill for at least 2 hours or overnight before serving. 20 minutes before serving pop it into the freezer. Serve with a dollop of sweetened whip cream. This entry was posted in Recipes and tagged key lime pie, key limes, recipe. Bookmark the permalink. A first for me: I tried out your recipe over the weekend. Easy as pie. Delicious! Yay! Always a relief to hear the recipes I post work out 😉 And as always lovely to hear from you.